Discerning Experts assesses the assessments that many governments rely on to help guide environmental policy and action. Through their close look at environmental assessments involving acid rain, ozone depletion, and sea level rise, the authors explore how experts deliberate and decide on the scientific facts about problems like climate change. They also seek to understand how the scientists involved make the judgments they do, how the organization and management of assessment activities affects those judgments, and how expertise is identified and constructed. Discerning Experts uncovers factors that can generate systematic bias and error, and recommends how the process can be improved. 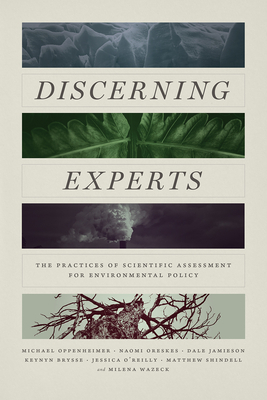 As the first study of the internal workings of large environmental assessments, this book reveals their strengths and weaknesses, and explains what assessments can—and cannot—be expected to contribute to public policy and the common good. Michael Oppenheimer is the Albert G. Milbank Professor of Geosciences and International Affairs at Princeton University. Naomi Oreskes is professor of the history of science at Harvard University. Keynyn Brysse is a historian of science with a focus on the history of paleontology. Jessica O’Reilly is an assistant professor of international studies at Indiana University Bloomington. Matthew Shindell is curator of planetary science and exploration at the Smithsonian’s National Air and Space Museum. Milena Wazeck is a historian of science and the author of Einstein’s Opponents. "What do the ozone layer, the Antarctic ice sheet, and acid rain have in common? All are sites of scientific 'assessments': prolonged, focused, collaborative, and often international work of experts. The thousands of pages of reports they draft offer the hope of summarizing scientific findings, extending scientific questions, and recommending policy outcomes. But do the elusive dream of consensus and fear of accusations of political bias produce watered down policy? Or should scientists be bolder in their assessments of impending disasters? Combining the insights of science, policy, and science studies, this valuable book offers a guide for experts of all kinds navigating the always messy world of policy-relevant science." "This book is a must-read for scientists and leaders of ongoing assessments, because it showcases the dilemma between consolidated knowledge, communicated as consensus, and the challenges of uncertainties associated with emerging science." "This is the first major study of what scientists actually do when they 'assess' in an assessment. It makes graphic how the development and assessment of scientific knowledge are interwoven and the vexed production of 'policy-ready knowledge' from this. Altogether a rich, original, and thought-provoking work." "The book is rich with insights about the ways assessments contribute to the agendas of science and policy, often in unintended ways. Reading it can improve the contribution of every scientist thinking of working on an assessment and the value obtained by every policy maker planning to use one."